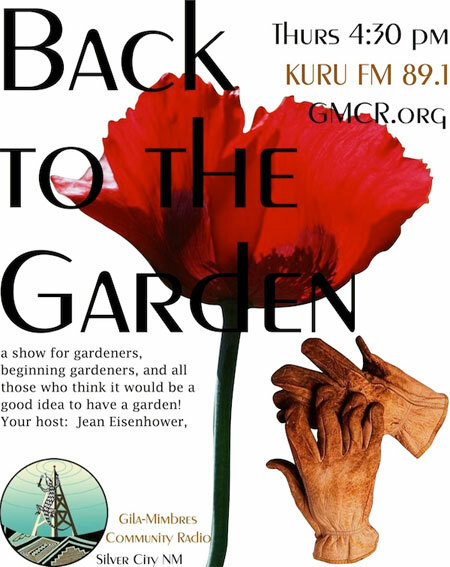 This week’s guest on “Back to the Garden” is Regina Vinson who has owned a nursery in Silver City for 19 years and has been gardening all her life. We’ll talk about pruning roses (it’s not too late! ), dividing perennials (“anything peeking out now”: day lilies, salvias, mint, grasses), pest control, and planting cool-season vegetables (now!). We’ll also talk about her blogsite, silverheightsnursery.blogspot.com, where she keeps readers apprised of what to do in the garden – in the Silver City area – month-by-month! but if you’re not able to catch the show at one of these times, the podcast will be available a day or two after the live broadcast which you can listen to at your convenience. This entry was posted in Back To The Garden and tagged back to the garden, jean eisenhower, regina vinson. Bookmark the permalink.